Motorizing your gate enables you comfortable and convenient access to your home at the click of a button on your remote control. The life of your gate is extended due to the easy, smooth operation. All our Automations are installed through our collaboration with the world leader in the automatic control of openings and closures in homes and buildings, Somfy. A click on the remote control and your gate opens in a few seconds; it’s quick and easy and no need to leave your vehicle to open it! Extra security: with a Motorized Gate, your gate is locked when in the closed position, preventing unwanted entry into your property. Complete Safety: an intelligent safety system is active during gate travel and reacts when an obstacle is detected. Power cut! Select the optional battery back-up pack to continue using your automatic gates even during a power cut! Each gate has a solution ! 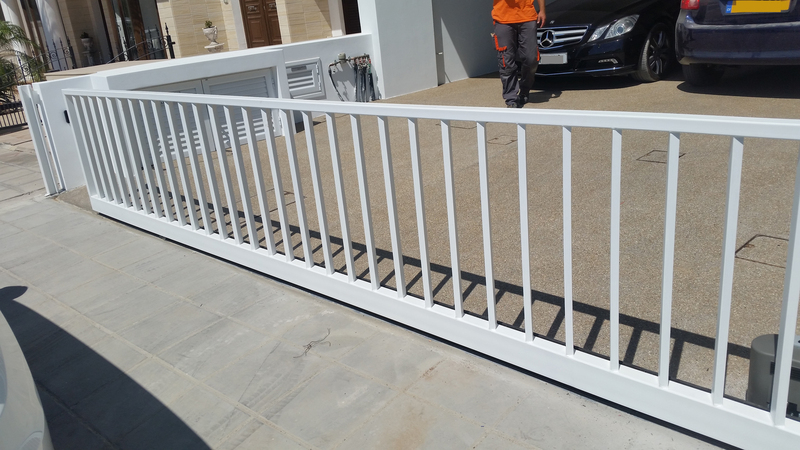 Swing gate or sliding gate, whatever the material, there is a Somfy solution to motorise your gates.All types of material can be used; PVC, metal, aluminium or wood. The two gate doors open inwards. Motors for swining gates are connected to a motor with an articulated arm or a motor with a worm and screw. The gate slides sideways on a guide rail. Motors for sliding gates are attached to a rack that slides the gate along the rail. All motors are powered by an electrical input on the gatepost and are fitted with a radio receiver. The motor is remote controlled using a radio receiver, typically a keyfob remote or wall switch. The motor can be fitted with a number of accessories which makes it easier to use including radio keypad, battery back up etc.